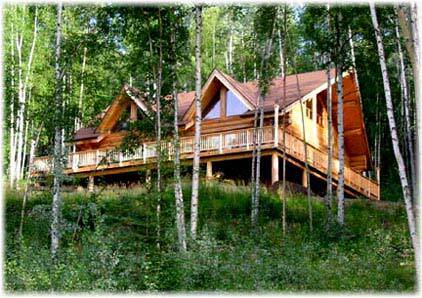 More intimate and private than a hotel, this lodge is located on three forested acres and has spectacular views of the Tanana River and the Alaska Range. Although it feels remote and secluded, it is just minutes from downtown Fairbanks, shopping areas, and major attractions. The house was built using traditional materials and centuries old building techniques including hand peeled 15" diameter spruce logs, solid cedar windows & doors. The main floor of the Lodge features a Great Room with a 22 foot vaulted ceiling, a massive fireplace, a large deck, fully equipped modern kitchen, a large dining room, a breakfast area, 2 charming bedrooms, and a full bath. A hand crafted, spruce staircase leads to the master bedroom, that has a private bath and stunning views of the entire valley below. The Lodge comfortably accommodates six or more people and is completely furnished. All linens, towels, and house-wares are provided. If you are arriving in Fairbanks by air, you may elect to be met at the airport and taken to the Lodge, or you may make arrangements for a rental car. An attendant will be in residence at the lodge in a private apartment on the ground level, to answer any questions and attend to anything you might need. We hope that your stay at Fjell Blikk Hytte will be both exciting and memorable.